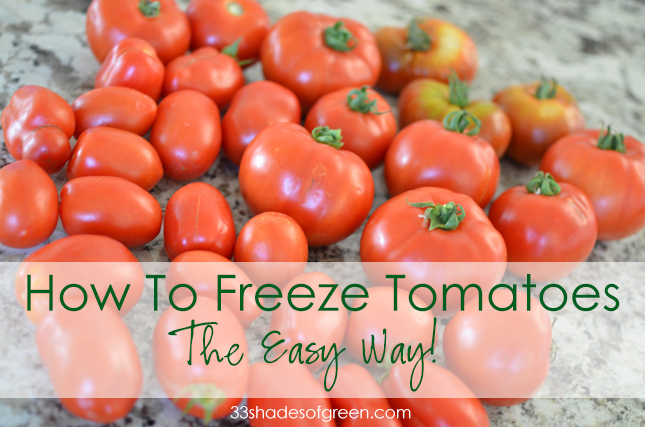 33 Shades of Green: How to Freeze Tomatoes - The Easy Way! I planted 9 tomato plants this year in my new raised beds, and boy, they are all going crazy! (I post lots of pictures from my garden on Instagram, if you'd like to see, click here) Last week it seemed as though all the full size tomatoes were ready for picking...all at once. 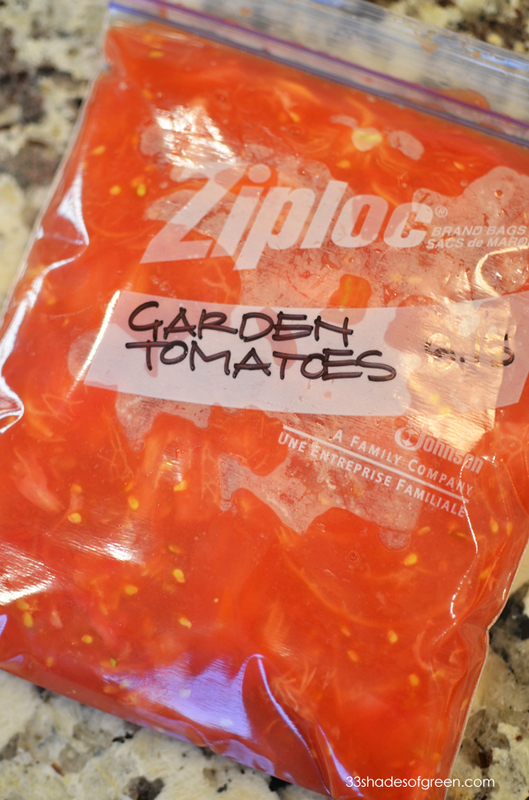 I was going out of town for a few days and knew I wouldn't be able to use the tomatoes up before I left, so I decided to freeze them for use later in the year. It was quick and easy, and I know I will be happy to have these in the freezer this winter. 1. Fill a large pot of with water and heat to a boil. Depending on how many tomatoes you have, you may find it best to start two pots. 2. 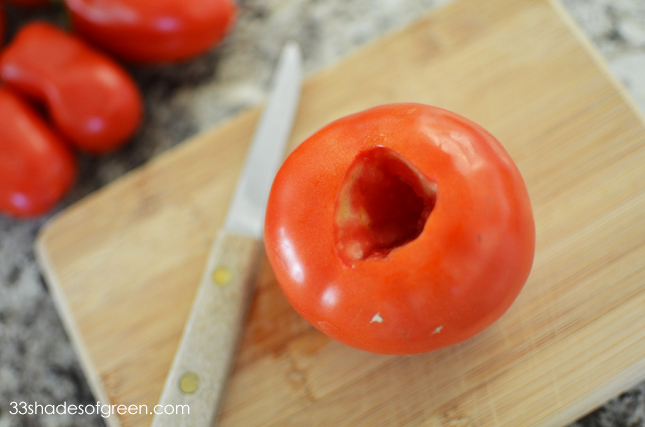 Use a paring knife to slice a "x" in the bottom of each tomato, then, core each tomato. 3. When water is boiling, drop in tomatoes. 6-8 tomatoes at once is good, depending on their size. 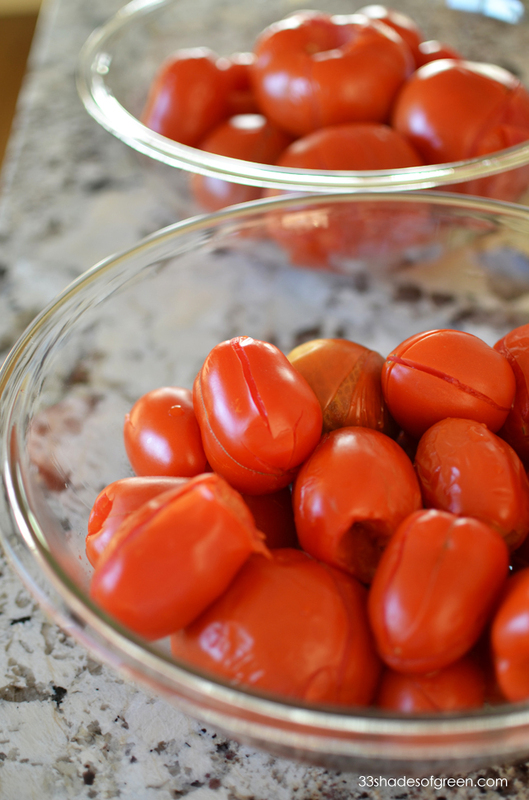 Boil tomatoes for 3-7 minutes. 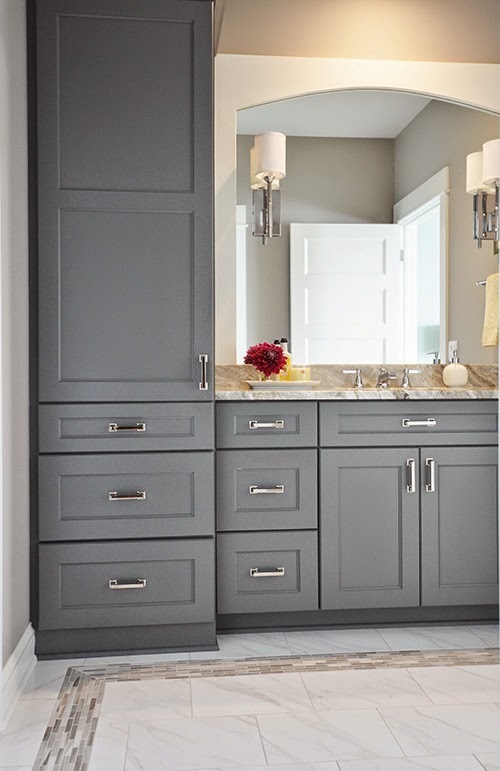 You will know when they are done by looking at the skin - if the skin has stared to peel and is shriveled, they are ready to remove from the water. Remove and place in bowls. Depending on how many tomatoes you have, you may need to repeat this process. 4. 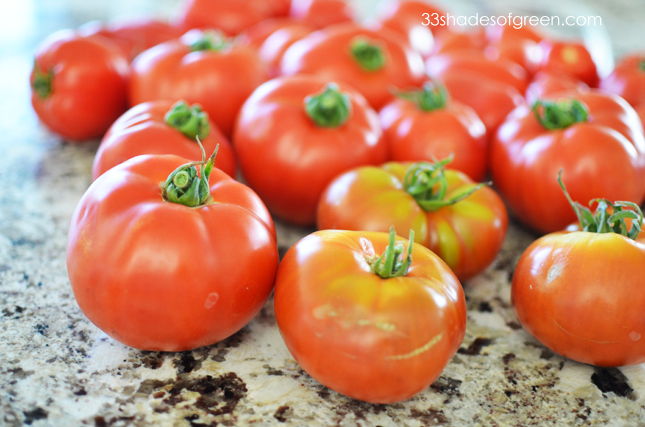 Tomatoes will be very hot, so let them cool until you can handle them. Using your hands, pull the skin away from the tomato; discard skin. 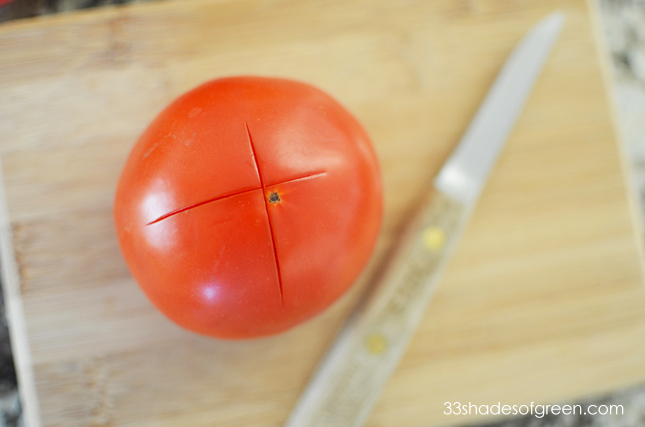 Use a knife to roughly chop up the tomatoes. 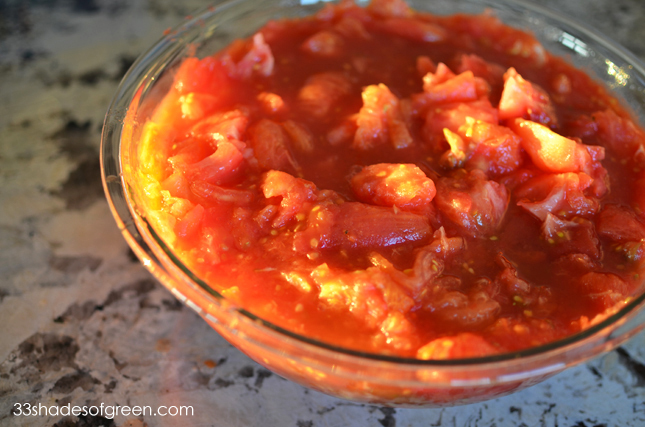 You may find it easiest to chop the tomatoes right in the bowl - that way, you won't lose any of the juices. 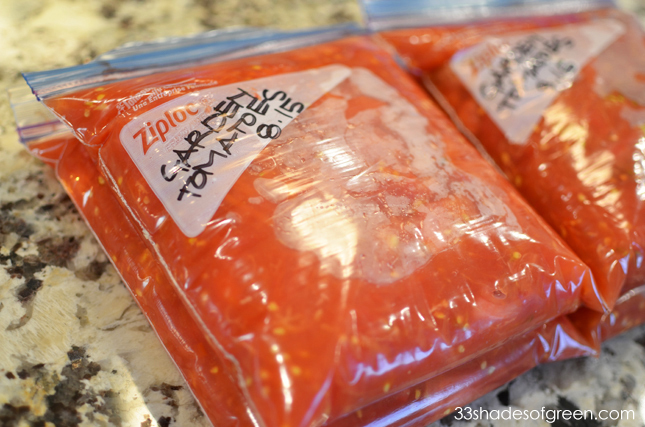 Using a ladle, place tomatoes and juices in quart size freezer bags. Carefully remove as much air as you can before sealing the bags. Place in freezer and start thinking of ways to use these this winter! One night's harvest in the garden resulted in 4 quart bags of tomatoes! I seem to make recipes calling for canned tomatoes quite often, so I know these will come in handy this winter. I'm off to pick more tomatoes from the garden!